June 08, 2018. 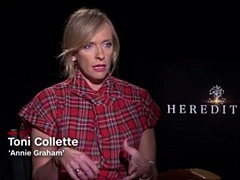 Toni Collette is interviewed by Entertainment Tonight about the theatrical release of "Hereditary" in the United States. June 08, 2018. Toni Collette is interviewed by Entertainment Tonight Canada for the theatrical release of "Hereditary". June 07, 2018. Toni Collette talks about the theatrical release of "Hereditary" and how it has been 18 years since her US breakout with "The Sixth Sense". June 05, 2018. Report on the theatrical release of "Hereditary", featuring interviews with Toni Collette, Alex Wolff and Milly Shapiro. June 01, 2018. Toni Collette chats about her scary new film "Hereditary", the upcoming BBC series "Wanderlust" and shares how she loves working in the United Kingdom. August 09, 2017. Senior Correspondent Arthur Kade goes #OneOnOne with actress Toni Collette who talks about her new film "Fun Mom Dinner", motherhood, "United States of Tara" and how she's maintained a successful career. August 06, 2017. Toni Collette discusses how empowering the film 'Fun Mom Dinner' will be for every audience, from moms, to dads and to children. April 28, 2005. Ugly Duckling to Swan Stories - including "Muriel's Wedding". September 30, 2015. Toni Collette is interviewed by Leigh Sales to promote the Australian theatrical release of Miss You Already. September 30, 2015. Toni Collette and Drew Barrymore promote the Australian theatrical release of Miss You Already. September 12, 2015. Promotional interview with Toni Collette and Drew Barrymore before the premiere of Miss You Already at the Toronto Film Festival. September 12, 2015. Report from the Toronto International Film Festival premiere of Miss You Already. May 22, 2014. 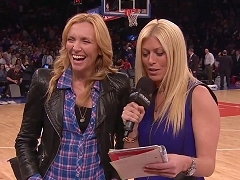 Toni Collette promotes the theatrical release of Lucky Them on Access Hollywood. Report on the Tribeca Film Festival premiere of Lucky Them, featuring interviews with Toni Collette, Thomas Haden Church, Oliver Platt, Ryan Eggold and Claire Newman. May 14, 2014. Toni Collette chats with Jill Martin about her film Lucky Them featured at this year's Tribeca Film Festival and about being a juror for the short film section at the festival. February 20, 2014. Toni Collette is interviewed at the press reception for The Realistic Joneses. September 2013. Toni Collette dishes on her television favorites, including The Bridge, Friday Night Lights and The Brady Bunch. September 19, 2013. Toni Collette and Dylan McDermott talk about the upcoming thriller series "Hostages". September 12, 2013. Interview with Toni Collette and Dylan McDermott to promote the series premiere of Hostages. September 09, 2013. Interview with Dylan McDermott and Toni Collette to promote the series premiere of Hostages. August 21, 2013. Toni Collette and Dylan McDermott talk about the upcoming thriller series "Hostages"
June 27, 2013. Report on the New York premiere of "The Way, Way Back", including interviews with the cast and crew.